Alternate title: The time we went out for WTGW and the bill for two people was less than $30. And that includes alcohol. And tip. Say what?!? I have to admit, we’ve been waiting all summer for the perfect WTGW to get to The Big Dog. 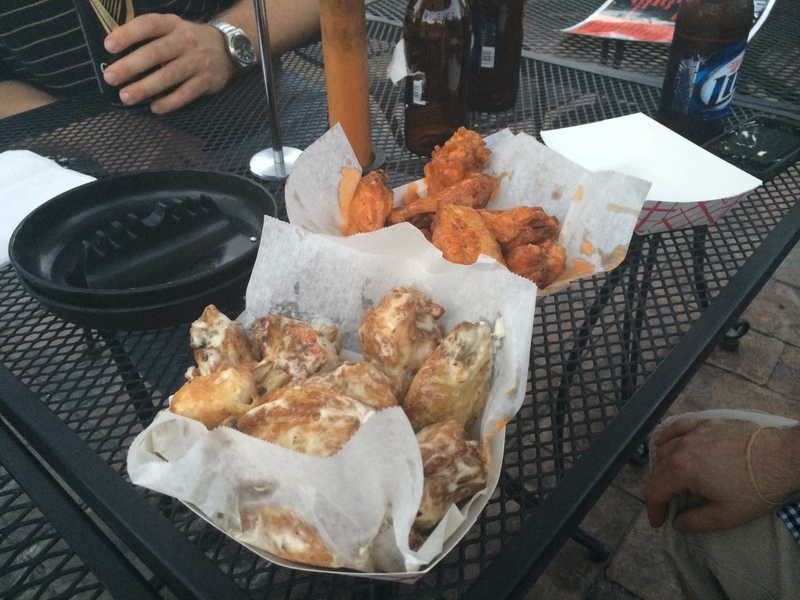 Two reasons: Wednesdays are 10 cent wing nights. Yes you read that correctly. And rumor was they had an amazing re-landscaped patio. I’m happy to report those statements were 100% accurate. Although, OK, I’ll admit it, we were a little scared driving up to the place – it’s kind of off the beaten path, and the buildings appear to be an old feed mill or collection of some sort of buildings re-purposed into the bar/restaurant. We parked across the street, by the scary-looking condemned conveyor … because, you know, why point out that there’s actually a closer (and less creepy) parking option behind the bar? But then again, had we parked there we would’ve missed the ambiance of the signs advertising Truck Night (complete with prizes for best chrome and highest lift!) as well as a nearby dumpster overflowing with used mattresses. I think it was at about this point in the evening that Amanda and I wagered a guess that we would be the only girls in the place wearing heels. So we walk in … and the inside of the bar kind of looked how we expected it to, given what we’d already seen. Kind of dark, large pool table in the middle of the room, stage off to one side. You know, typical biker/college/small town townie bar. 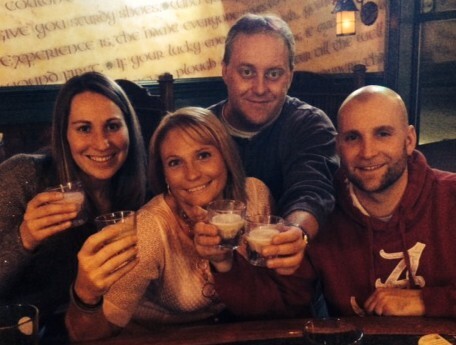 It was like we entered some sort of drinker’s oasis or parallel universe. 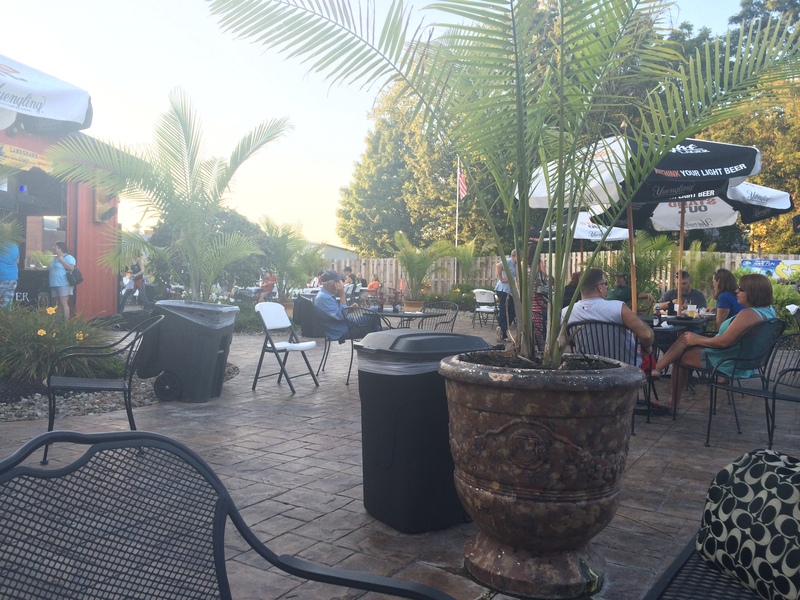 Huge brick patio, complete with landscaping, waterfalls, corn hole boards, a stage for a band, and an outdoor building re-purposed into a bar. Welcome to Ravenna’s version of East Eden, my friends. Now, I could be mistaken, but it seems like really all they serve is wings and assorted fried foods. I’ve never seen the word fried so many times on one menu. This place clearly has your health as a #1 priority. 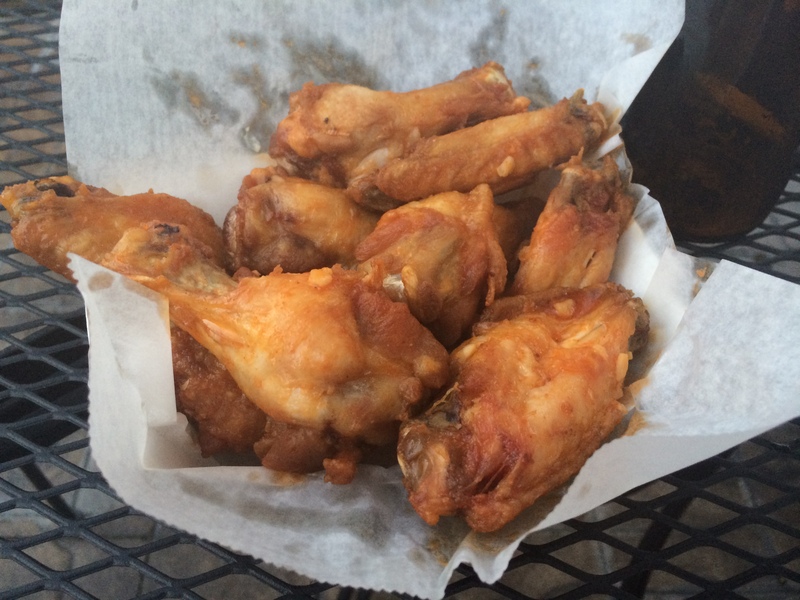 We weren’t really sure what to expect with 10 cent wings – but I’m pleased to report we were pleasantly surprised. 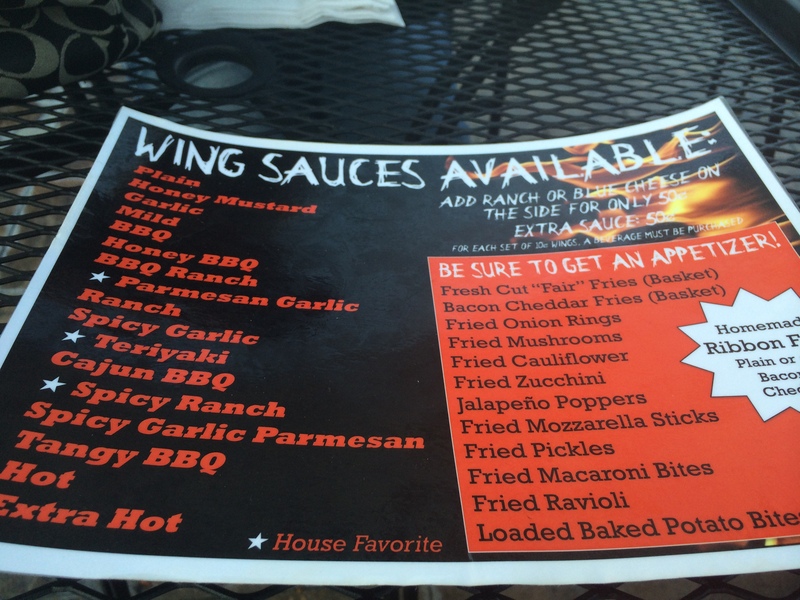 The wings are actually good sized, and the list of sauces was somewhat impressive given the price. 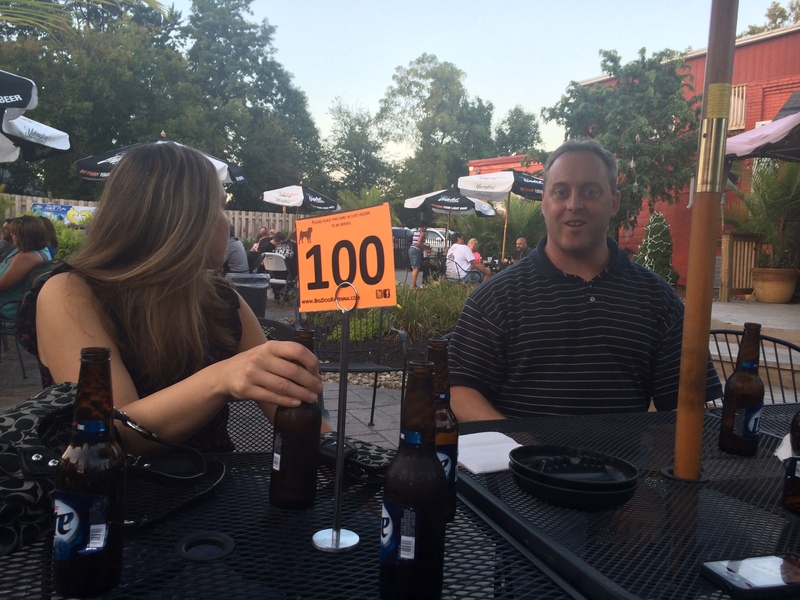 Little tip: you have to order the wings in increments of 10, and for every 10 wings you also have to order one beer. Um, yeah, OK, twist our arms. That’s the kind of math I actually like. 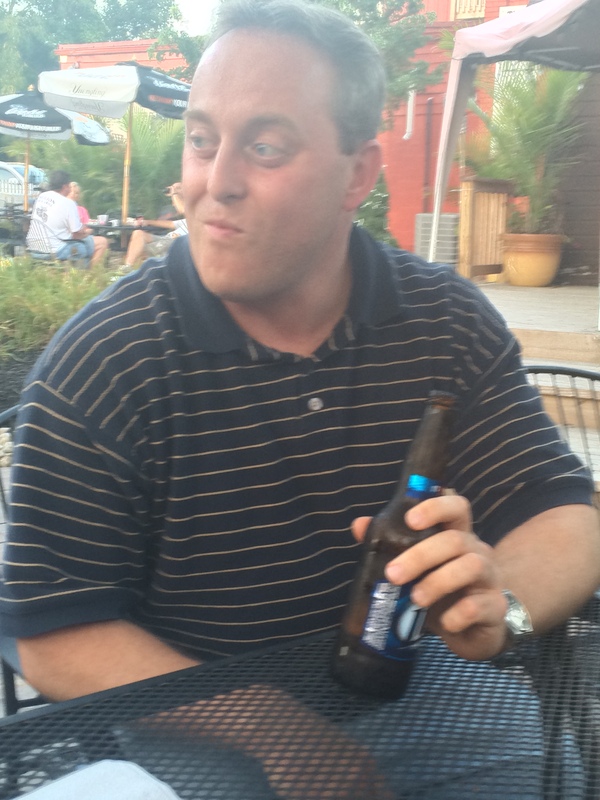 Ted chugs a Miller Lite. And his face pretty much sums up how he feels about it. For the wing flavors, Amanda had 10 of the spicy ranch, as did Shane. Shane also had 10 of the regular ranch – but the spicy ranch were the clear winners there. I’m honestly not sure why he even got the plain ranch – since he’s always all “I’ll-get-ranch-but-only-if-its-not-the-actual-ranch-dressing-and-more-like-the-packet-of-seasoning-because-I-like-that-better” picky about his flavors. I mean, don’t get me wrong, he still ate all 20. Because we don’t send wings to starving children in Africa. Ted tried the garlic and the extra hot – because apparently he likes to visit both ends of the spectrum. The extra hot indeed lived up to their name and were just that … and not just in contrast to the blandness of the plain garlic. One for one, I guess. Although Ted disappointed us by not finishing all 20 of his wings. Blame it on the Miller Lite. I ordered spicy garlic parmesan. But I have to believe the bartender stopped listening before I was done with my order, because I swear the wings I got were just spicy garlic, no parmesan. Not only did I not actually see the parmesan on the wings, but they didn’t have a lot of flavor. Maybe my taste buds are just overconditioned from the past year of bar food and wings, but even the “spicy” wasn’t all that spicy. They just didn’t seem to have a lot of flavor, especially after I traded with Shane to try the spicy ranch. And as much as I tried to trade his basket for mine, he wasn’t having it. He’s a lot smarter than he looks sometimes. Rounding out the cholesterol fest at our table, we also ordered the fried cauliflower and a basket of fair fries. Because who needs clear arteries, right? Amanda actually tried to order the fried macaroni bites and were told they don’t make them anymore. Same with the loaded baked potato bites. Because printing and laminating new one page menus is clearly too expensive. I mean, have you seen the new patio? Fried cauliflower still counts as a vegetable, right? Overall The Big Dog is a good pick, and I could see us going back. It would be fun to see a band there … but only if they’re outside on the patio, since honestly the inside of the place kind of scared all of us. The only downfall was that there are no lights on the patio, so once it got dark they closed the outside bar – meaning you’d have to go inside to get a drink. See my previous statement to know how we felt about that. 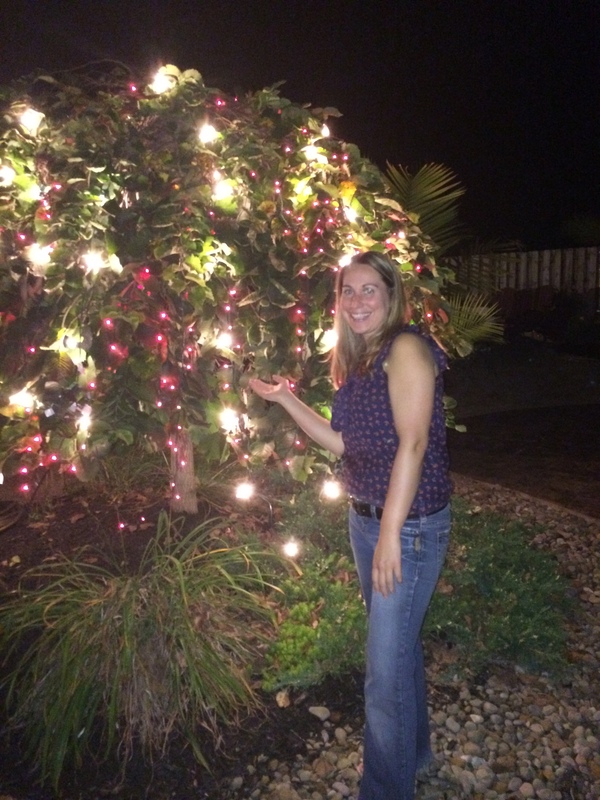 This was really the only light on the patio after the sun went down. Actually, if it wasn’t about a 35 minute drive away I could pretty definitely see us becoming regulars for the 10 cent wing nights. Although I guess that would mean we’d have to stop finding new places to go on Wednesdays, and then in effect change this entire blog … so I guess the universe is doing us a favor by keeping things the way they are. Thanks? 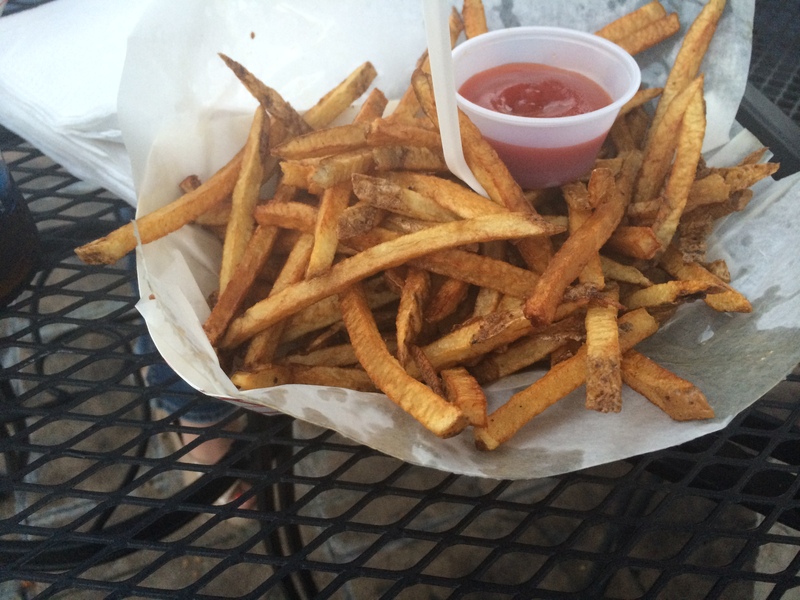 Drinks: Basic dive bar fare – bottled domestics and Bud Light on draft. Our resident “up for trying anything” craft beer guy (Ted) had to settle for Guiness in a can, if that tells you anything. Food: I seriously don’t know if they serve any other food than wings and assorted fried stuff. Regardless, this is a bar food type of place, so if you want a salad you’re definitely out of luck. Service: The place is pretty much get-it-yourself as far as drinks go, but the bartender was pleasant and helpful without making us feel stupid for being virgins to the place. 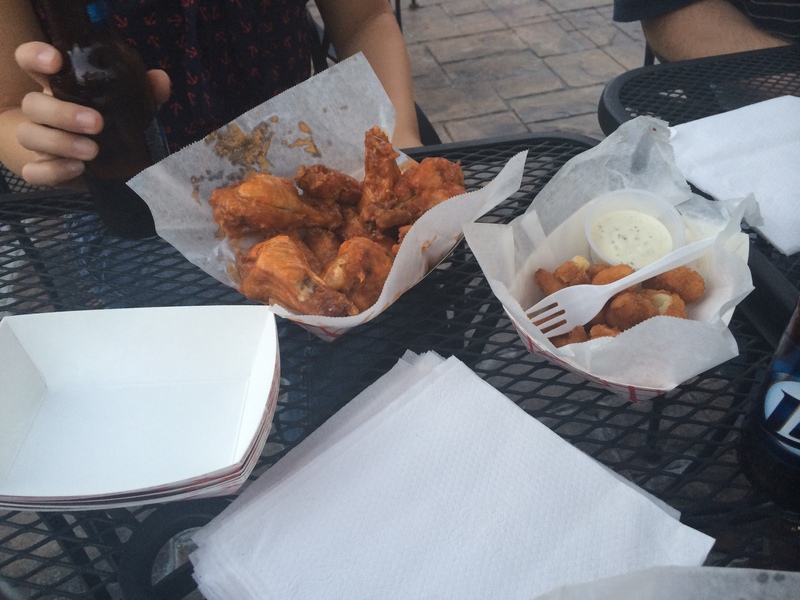 Overall: 10 cent wings on Wednesdays and a great patio. That’s really all you need to know.